"Go...and baptize all nations in the name of the Father, and of the Son, and of the Holy Spirit." The Bible teaches us that God is "Triune." "Triune" is composed of two Latin words--"Tri" (meaning "three") and "Une" (meaning "one"). The word "Trinity" is derived from "triune" and also means "three-one." of the "three-one"-ness of God is. The Bible simply teaches that there is one God, but there are three persons in this one God. The Father, the Bible teaches, is God. The Son, also, is God. So is the Holy Spirit God. But there are not three Gods, but one God. The Bible teaches the Doctrine of the Trinity in numerous places. The Old Testament Book of Genesis teaches this doctrine in the account of Creation in Genesis 1-2. St. Paul and others in the New Testament also speak of God--Father, Son and Holy Spirit. Jesus taught the Trinity in Matthew 28:19-20. In the Gospel of John, Jesus often mentions God, the Father as well as the God, the Holy Spirit. By also claiming Himself to be God, Jesus Himself teaches us this doctrine in a most convincing way. Because the Trinity is taught in the Bible, three ecumenical creeds also include this essential Christian doctrine of the Trinity. The Apostles' and Nicene Creeds both have three "articles" or divisions--one for each member of the Trinity. Each article of the Apostles' Creed, for example, begins, "I believe in God, the Father Almighty...And in Jesus Christ, His only Son, our Lord...I believe in the Holy Spirit, the Lord and Giver of life..." The Nicene Creed follows the same pattern. The Athanasian Creed, however, goes into remarkable depth and detail on this essential doctrine. Because of the confusion and controversy surrounding the Trinity, the fourth-century Christian Church needed a statement--a creed--to clarify this Biblical teaching. Athanasius, a prominent church leader at the time, led the development of the Athanasian Creed, named in his honor. Found in most Lutheran Hymnals, the Athanasian Creed is considered one of the definitive Christian statements regarding the Doctrine of the Trinity. Divided into two main parts, the first part of the Athanasian Creed contains key statements regarding the Trinity. Below are five key statements regarding the Doctrine of the Trinity. First, Belief In The Trinity Is Absolutely Necessary For Salvation. Second, Understanding the Trinity Is Necessary For Salvation. Third, The Father, Son and Holy Spirit Are Not Identical. Fourth, As God, Father, Son and Holy Spirit Share The Same Divine Characteristics. Fifth, Father, Son and Holy Spirit, Though Separate And Fully God In Themselves, Are Together One God. “So likewise the Father is almighty, the Son almighty, and the Holy Spirit almighty. And yet they are not three almighties but one Almighty. So the Father is God, the Son is God, and the Holy Spirit is God. And yet there are not three Gods but one God...."
He therefore that will be saved is compelled thus to believe in the Trinity. The second part of the Athanasian Creed contains a detailed account of the Bible's teaching regarding Jesus' two natures. "It is also necessary for everlasting salvation that one faithfully believe the incarnation of our Lord Jesus Christ....It is the correct believe that we believe and confess that our Lord Jesus Christ, the Son of God, is...perfect God and perfect man....equal to the Father with respect to His divinity, less that the Father with respect to His humanity. Although He is God and man, He is not two, but one Christ." As the Athanasian Creed correctly declares, one cannot be saved unless one believes this essential, fundament Christian teaching. Jesus had to be God to forgive our sins; He had to be man to be our substitute. Without this understanding of Jesus, we fail to understand the remarkable, miraculous work of God, the Son, who became incarnate--human--to save us. How do we explain the Doctrine of the Trinity? The following are often used to explain the Trinity. 1) Triangle: Like God, a triangle has three sides. Yet it is only one triangle. 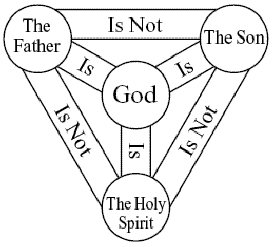 This is the most common explanation of the Trinity and is often depicted as the following diagram. 2) Water: Like God, water has three forms--ice, water and steam. 3) Math: 1 x 1 x 1 = 1. Each person of God is like the "1"--fully God, yet separate. Ultimately, all of these analogies fail. Why? Because we cannot describe God, who is greater than all of creation, with humble elements within His creation. Christian Theologians have sought to explain this doctrine for hundreds of years. Yet, it still remains outside of our complete understanding. Should we expect to be able to understand everything about God? No. After all, we're merely human beings. If we could understand everything about God, we would be God. Since we are not Gods, we simply cling to what God has revealed about Himself in the Bible...No more, no less. Though a prominent Biblical writer, St. Paul also realized he could not fully understand God. "Oh, the depth of the riches of the wisdom and knowledge of God! How unsearchable His judgments and His paths beyond tracing out! We can't understand God. But we can trust His holy Word which declares Him as Father, Son and Holy Spirit. Materials May Not Be Reprinted Without Written Permission Of The Author.